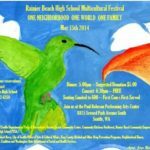 You are cordially invited to attend Rainier Beach High Schools 2010 Multicultural Dinner and Dance. NextSouth Rainier Valley Safety Meeting changed to May 19! Life Long Learning Action Team Meeting Tonight Aug 22 6:30 pm!